Growing up, Mount St. Joseph senior Casey Moninghoff saw his parents regularly run St. Patrick’s day and Thanksgiving day road races. He thought it looked fun, and so as a freshman, he joined the Mount St. Joseph outdoor track and field team, where the 4X400 meter relay has become his best event. 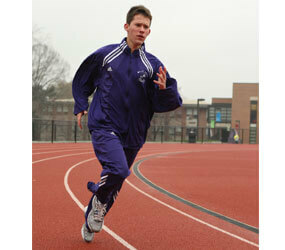 In addition to four years of track, Moninghoff has also played baseball since the age of 3 or 4. He currently plays center field for the Columbia Bull Dogs, an under-19 wooden-bat league. Moninghoff was evaluated for and attended the Coast to Coast Baseball Camp and Showcase at the Roger Dean Complex in Jupiter, Fla., at the end of December, where he worked with top college coaches. “I feel my spirit and my heart and passion for the game were a key in my being chosen, as well as my athletic ability,” Moninghoff said. At the camp, he had the opportunity for both personal and group instruction. When he’s not on the track or the baseball field, Moninghoff is involved in campus ministry at his Irvington school. He serves as an extraordinary minister of holy Communion during Masses and volunteers at St. Vincent de Paul of Baltimore’s Sarah’s Hope soup kitchen. Outside of school, he is an altar server and sacristan at Shrine of the Sacred Heart.